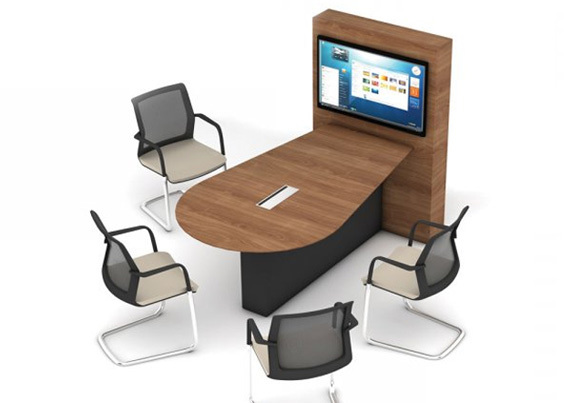 With a simplistic, sleek design Reef media units offer offices an area for small team meetings, video conferencing and group work. Reef is available in a variety of styles - designed with adjustable modules to adapt the unit into a space that is individual to each office or team. Starting with a freestanding unit there are options of adding a bench or desk height table for up to 6 people, a rotating power unit containing 2 power and 2 data sockets and a monitor up to 37 inches, making the Reef unit an excellent media solution. Finishes can be personalised too, either to your personal preferences or the office decor. The Melamine tops are available in White, Maple, Oak, Cherry or Walnut.